(Glenboden M&A Leads) When will Suntory bid for SunnyD ? Even their names suggest they should come together. Having been tipped off by search activity on Glenboden, we look at the rationale and trajectory behind the acquisition of private equity -owned juice maker SunnyD in the US, by Japan's Suntory. SunnyD a ripening target ...In recent years, SunnyD has worked hard to transform itself from a purveyor of cheap, sugary orange juice, into a portfolio of better-for-you FJND; thus striving to become more attractive as an M&A target. It has entered the smoothies market with FruitSimple, and powdered enhanced drinks with Elations. It also acquired Veryfine juice drinks and Fruit20 flavoured waters from Kraft in 2007, and Bossa Nova superfruit juices in 2009. ... Suntory's FJND deal momentum ...Meanwhile, there's a famous 'race' on between the Japanese food & beverage giants, Suntory, Kirin and Asahi, to make overseas acquisitions, in order to compensate for their cash-generative, but declining, domestic beer market. In the case of Suntory, that's meant the acquisition of Frucor from Danone in New Zealand in 2008; then the acquisition of Orangina from Blackstone and Lion Capital in 2009 (NB. our value estimate is based on these deals). 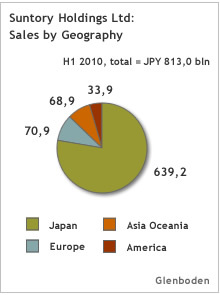 As a result, in H1 2010 Suntory's sales outside Japan nearly doubled over H1 2009. However they still constitute only about 20% of group sales, and the Americas are particularly poorly represented (see chart). ... has money to spend and SunnyD fits wellIn spite of spending about âŹ 3 bln on the above two deals, earlier in 2010 Suntory announced a warchest of âŹ 4 - 5 bln for more acquisitions, over the next five years; possibly with the help of an IPO. Through buying Frucor and Orangina, Suntory has become a leading soft drinks and FJND player in Oceania and in certain countries in Europe. Why not achieve the same status in the US by acquiring SunnyD ? Especially when SunnyD is, like Orangina, owned by private equity; JW Childs bought the company from Procter & Gamble in 2004. Also like Orangina, SunnyD is a legacy brand.